Africa remains the region with the highest level of undernourishment: 20 percent of Africans do not have enough food to feed themselves and their families. 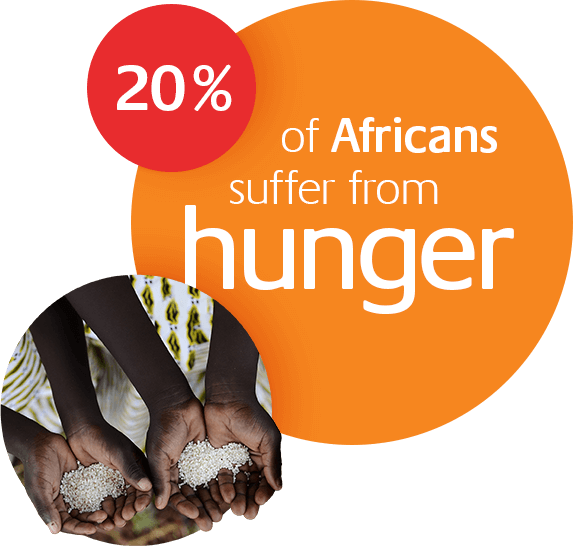 Malnourishment stunts the growth of many young Africans. By threatening food production, climate change could increase hunger and malnutrition by up to 20 percent by 2050. To help farmers build profitable businesses, the Foundation advocated for better policies and increased investment in African food systems and smallholder agriculture. The Foundation encouraged financial and policy commitments on nutrition. To prevent stunted growth, we promoted the orange flesh sweet potato as an affordable source of Vitamin A. In collaboration with the World Bank, the Foundation advocated for climate action. We pushed for more investment in climate-smart agriculture across Africa to help farmers adapt to the impacts of climate change. The Foundation advocates at the highest political and corporate levels for fairer, more productive and nutritious food systems so that Africa can feed itself. Together with the African Development Bank, we study the state of the food market in Africa to identify policy options and strategies that will boost intra-African food trade and market integration. The Foundation will continue to advocate for greater action and ambition to tackle climate change and help the poorest in the world to adapt to its impacts. We advocate for action combatting the effects of snakebite, which kills between four and six times more people than dengue fever, and disables many more, especially in the Global South.